Twenty years after turning the rock world upside down with release of Sparkle & Fade, Everclear have delivered a solid mix of new and old with Black Is The New Black. I thought all hope was lost for Everclear. After a string of hits between So Much For The Afterglow and the lesser-appreciated Songs From An American Movie series, the California rock outfit spent a good portion of the 2000s struggling to find a sound that fans, including myself, wanted to hear. Starting with Slow Motion Daydream, the band began to descend from their alternative rock throne and started releasing a series of hit-and-miss records filled to the brim with material that was largely forgettable. Sales dropped, tours became increasingly infrequent, and like many others I turned my back on a band I once loved. If there was any remaining doubt that Art Alexakis could still pen a song that wields the ability to make you smile in one moment, then in the next push you to the edge of tears, those worries can now be forgotten. Black Is The New Black ushers in the return of Everclear’s wit and unabashed honesty regarding the often ugly side of reality. From the sexual exploits and embrace of drug use prevalent in “Sugar Noise,” to the exploration of waking up on the wrong side of the party life on “Anything Is Better Than This,” few moments on the last two Everclear records can hold a candle to the unflinching lyricism on display throughout this release. “Complacent” may be the best of the bunch, blending the sound of Sparkle with an ever-so-slight modern edge to make the whole affair feel intoxicating in an entirely new way. It’s familiar, yet undeniably different. Alexakis’ injection of personal tragedy and growth has always been at the center of the best Everclear material, and that is once again the case here. We learn about relationships gone awry, childhood scars that still hurt like fresh wounds, and Art’s undying desire to be the better man everyone seems to perceive him to be. That inner turmoil is key to Everclear’s continued success, and for the first time in a long time its effectiveness is once again undeniably engaging. If “Simple and Plain” doesn’t speak to you, there is a 90% chance you’re dead inside. Not everything works as well as the throwback sound of “Complacent” or the borderline pop punk vibes of “This Is Your Death Song” unfortunately, but most of the rest is tolerable at the very least. “American Monster,” which was used to promote the album, has far more bark than bite. It’s loud and meant to hook you, but the lyrics and melody lack the infectiousness needed to keep you engaged throughout. Likewise, “You” gets a little too lyrically overdramatic to demand many repeat visits. “Safe,” the closer, comes close to being a drawn-out and needlessly complicated power ballad, but the band manages to somehow keep things somewhat in the realm of quality the entire five-plus minutes. 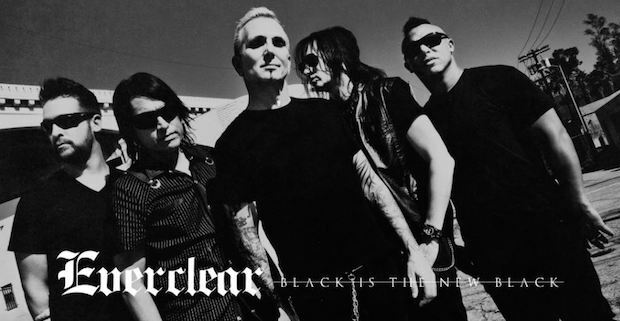 At the risk of overstating the quality of this release, Black Is The New Black is the best new Everclear record in over a decade. It’s catchy, yet complex, and littered with more thought-provoking tales of life in today’s society than the latest issue of Time magazine. It’s nothing outside the realm of expectation for the band, but that is exactly what fans want at this point, and for the first time in recent memory the band actually delivered. They delivered in a big way, in fact, and with smart future single choices (“Complacent”) I can almost believe in the possibility of the band returning to radio one day. Probably not, but hey – at least they made it this far. Huge fan of this record. Heavy guitars, deep bass, pounding drums. Just an in-your-face rock-n-roll record. Get in the car and crank it up and go for a drive.